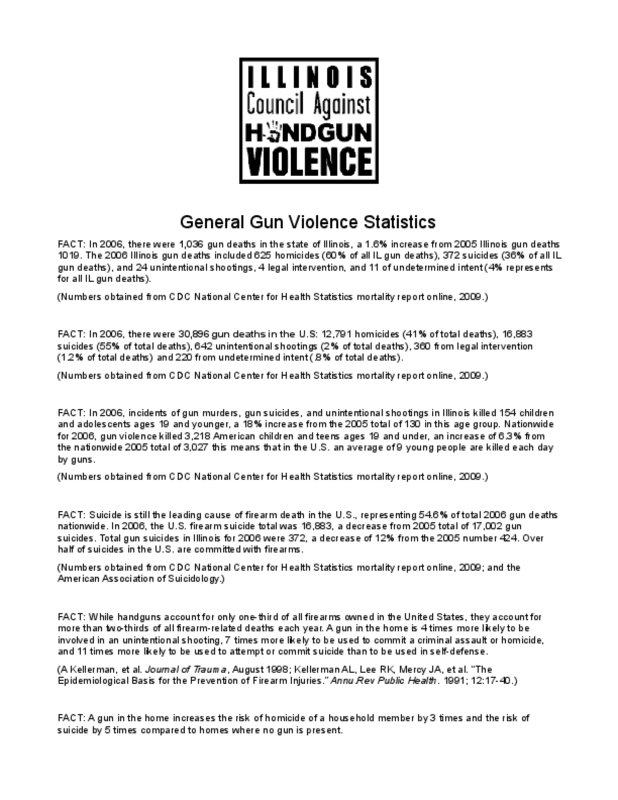 This fact sheet compiles statistics, facts, and quotes on gun violence from a wide variety of sources. Objective: To describe gun shows and assess the impact of increased regulation on characteristics linked to their importance as sources of guns used in crime. Design: Cross-sectional, observational. Subjects: Data were collected at a structured sample of 28 gun shows in California, which regulates these events and prohibits undocumented private party gun sales; and in Arizona, Nevada, Texas and Florida -- all leading sources of California's crime guns -- where these restrictions do not exist. Main outcome measures: Size of shows, measured by numbers of gun vendors and people in attendance; number and nature of guns for sale by gun vendors; measures of private party gun sales and illegal surrogate ("straw") gun purchases. Results: Shows in comparison states were larger, but the number of attendees per gun vendor was higher in California. None of these differences was statistically significant. Armed attendees were more common in other states (median 5.7%, interquartile range (IQR) 3.9 - 10.0%) than in California (median 1.1%, IQR 0.5 - 2.2%), p = 0.0007. Thirty percent of gun vendors both in California and elsewhere were identifiable as licensed firearm retailers. There were few differences in the types or numbers of guns offered for sale; vendors elsewhere were more likely to sell assault weapons (34.9% and 13.3%, respectively; p = 0.001). Straw purchases were more common in the comparison states (rate ratio 6.6 (95% CI 0.9 to 49.1), p = 0.06). 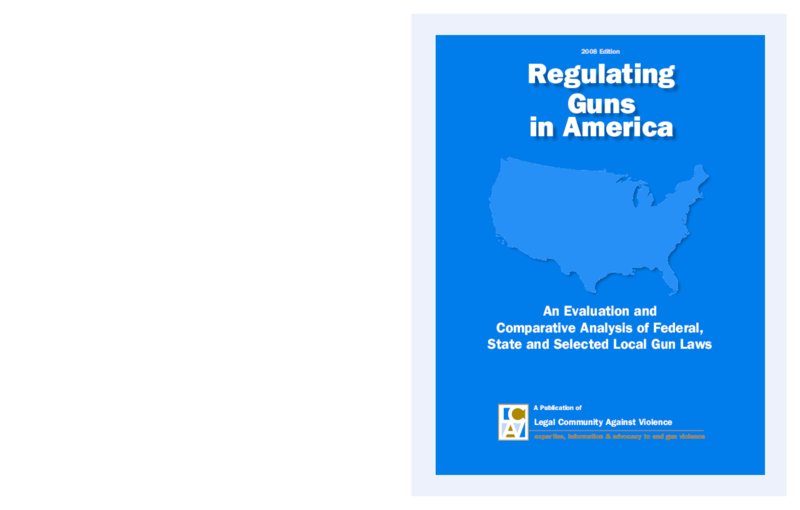 Conclusions: California's regulatory policies were associated with a decreased incidence of anonymous, undocumented gun sales and illegal straw purchases at gun shows. 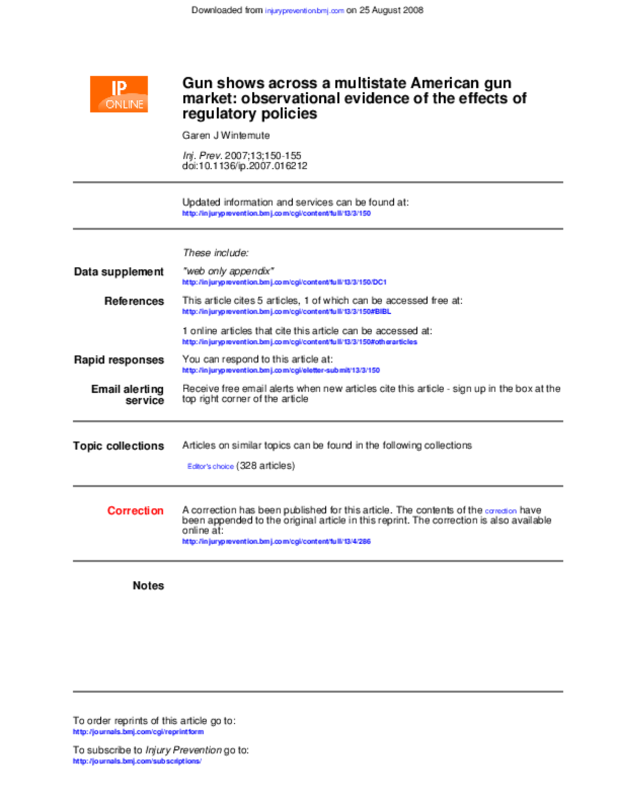 No significant adverse effects of these policies were observed. The world abounds in instruments with which people can kill each other. Is the widespread availability of one of these instruments, firearms, a crucial determinant of the incidence of murder? Or do patterns of murder and/or violent crime reflect basic socio-economic and/or cultural factors to which the mere availability of one particular form of weaponry is irrelevant? 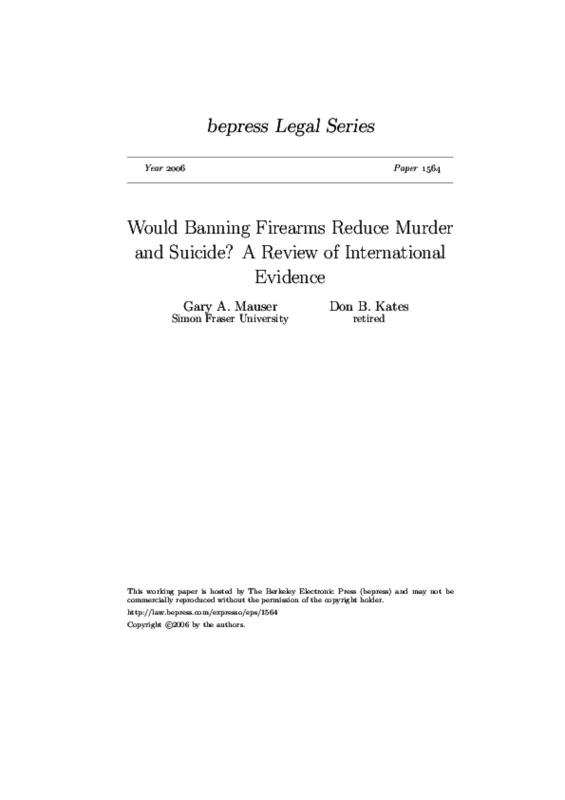 This article examines a broad range of international data that bear on the question whether widespread firearm access is an important contributing factor in murder and/or suicide. Our conclusion from the available data is that suicide, murder and violent crime rates are determined by basic social, economic and/or cultural factors with the availability of any particular one of the world's myriad deadly instrument being irrelevant. Though gun violence peaked in American cities in the early 1990s, firearms are still used in more than 30 homicides per day in the U.S. One major challenge is how to stanch the flow of guns to criminals. Researchers from the School's Center for Gun Policy and Research have recently zeroed in on illegal sales by licensed dealers (the dominant means of diverting guns into illegal markets). These sales include unrecorded, "off the books" transactions and "straw purchases" in which a person unable to pass a federal background check relies on another individual for the purchase. Daniel Webster, MPH, ScD '91, Center co-director, wants to increase the accountability of gun dealers. 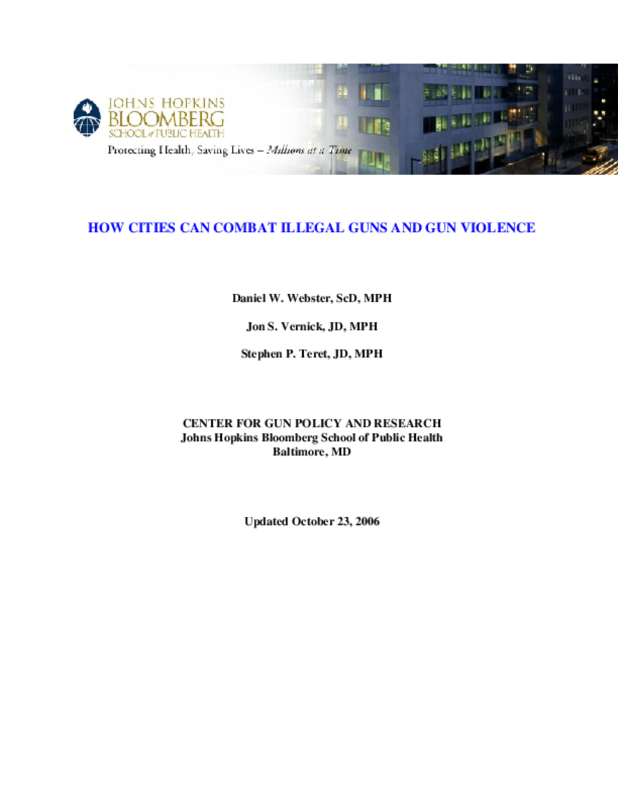 This report outlines how to reduce illegal gun trafficking, reduce illegal gun carrying, and use technology to prevent gun violence. 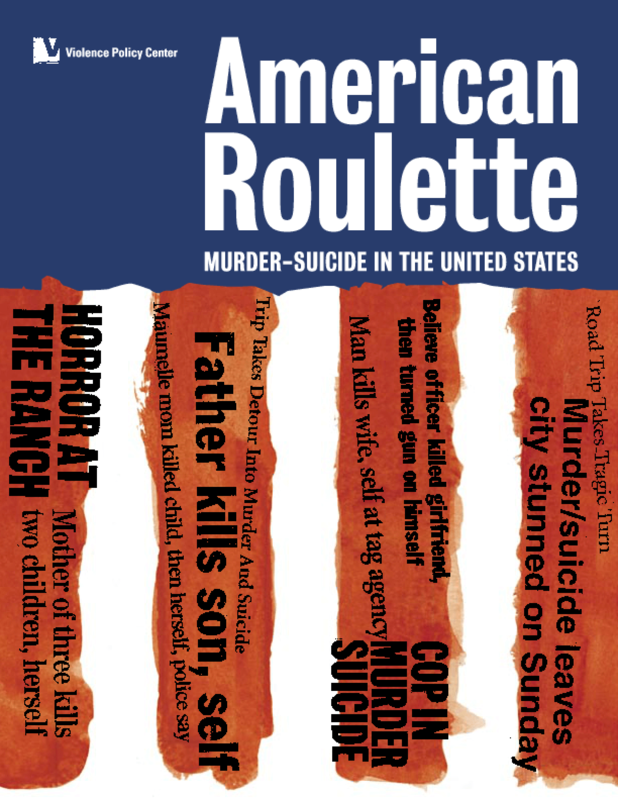 More than 10 murder-suicides, almost all by gun, occur each week in the United States, according to "American Roulette: Murder-Suicide in the United States", a new study by the Violence Policy Center (VPC). The study used a national news clipping service and Internet survey tools to collect incidents nationwide from January 1, 2005, through June 30, 2005, and is one of the largest and most comprehensive studies ever conducted on murder-suicide. During this six-month period, at least 591 Americans died in 264 murder-suicides, and almost all murder-suicides (92 percent) involved a firearm. Using these figures, the VPC estimates that nearly 1,200 Americans die each year in murder-suicides. VPC Legislative Director Kristen Rand states, "Murder-suicide wreaks havoc on hundreds of American families each year. Much more needs to be done to understand and prevent murder-suicide. 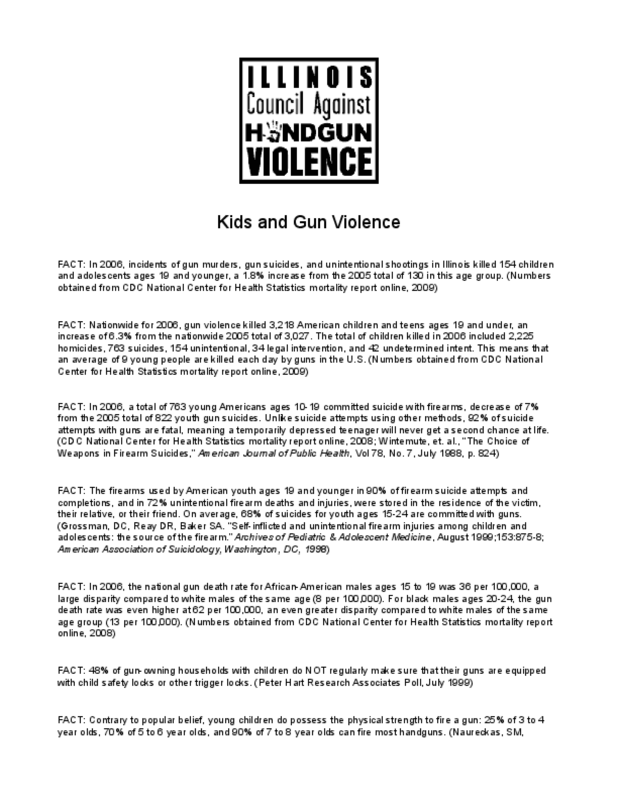 One key aspect of prevention is reducing access to firearms, by far the weapon of choice in murder-suicide." Objective: To determine the retailer and community level factors associated with frequent and disproportionate sales of handguns that are later used in violent and firearm related crimes (VFC handguns). Design: Cross sectional. The authors used California records to identify all handguns sold by study subjects during 1996-2000 and federal gun tracing records to determine which of these guns had been recovered by a police agency in the US or elsewhere and traced by 30 September 2003. Subjects and setting: The 421 licensed gun retailers in California selling at least 100 handguns annually during 1996-2000. Main outcome measure: The number of VFC handguns per 1000 gun years of exposure. Differences are expressed as incidence rate ratios (RR) with 95% confidence intervals (CI). Results: Subjects accounted for 11.7% of California retailers with handgun sales, 81.5% of handgun sales, and 85.5% of VFC handguns. Among subjects, the 3426 VFC handguns accounted for 48.0% of all traced handguns and 65.0% of those linked to a specified crime. The median VFC handgun trace rate was 0.5/1000 gun years (range 0-8.8). In multivariate analysis, this rate increased substantially for each single-point increase in the percentage of proposed sales that were denied because the purchasers were prohibited from owning guns (RR 1.43; 95% CI 1.32 to 1.56), and was increased for pawnbrokers (RR 1.26; 95% CI 1.02 to 1.55). Community level crime rates and sociodemographics had little predictive value. 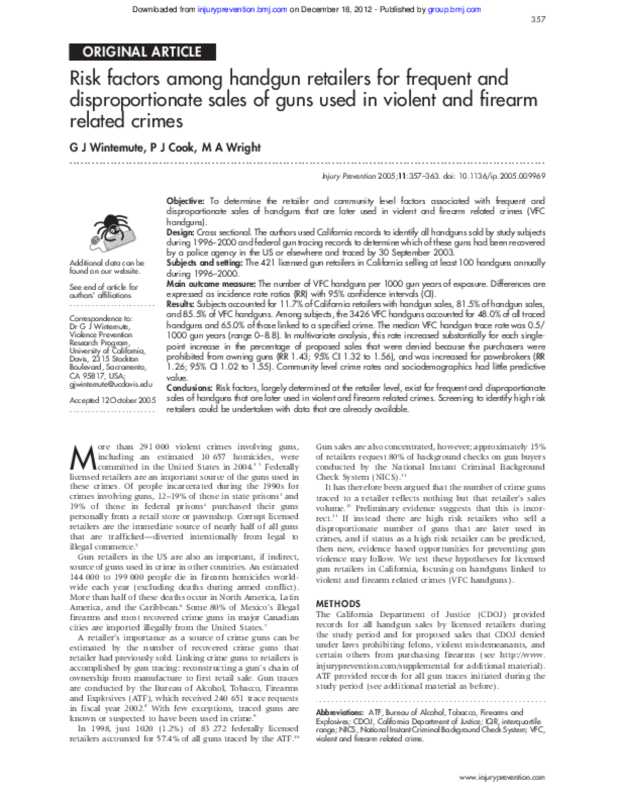 Conclusions: Risk factors, largely determined at the retailer level, exist for frequent and disproportionate sales of handguns that are later used in violent and firearm related crimes. Screening to identify high risk retailers could be undertaken with data that are already available.